A skills gap is the difference between skills that employers want or need, and skills their workforce offer. Conducting a skills gap analysis helps you identify skills you need to meet your business goals. It can also inform your employee development and hiring programs. Individual: You can identify the skills a job requires and compare them to an employee’s actual skill level. Team/company: You can determine if your employees have the skills to work on an upcoming project or if you need to hire externally. This analysis can help you target your employee training programs to develop the skills you need. HR can initiate team and company-wide skills gap analyses by holding a meeting with managers to explain the process. It can also be a good idea to hire an external consultant to conduct a skills gap analysis. Hiring an outside evaluator can make the process more objective and will free up staff time to focus on other relevant work. What skills do we value as a company? What skills do our employees need to do their jobs well now and in the future? Consider your company’s job descriptions, business objectives and company values. Think of the new skills your company might need in coming years. You could also survey team members on what skills they think are missing. Their insights could prove invaluable and involving your employees can help them feel that they’re contributing to your company’s growth. Numerical rating scales can be a more practical way to assess skills gaps when you want to aggregate individual scores. You could use a five-point or three-point system. Ensure you have explicitly defined scales. For example, a scale of 1 to 5 could range from poor to excellent, or inexperienced to expert. Skills management software, like Skills DB Pro and TrackStar that can make a skills gap analysis much less time-consuming. Sometimes, a skills gap can result from limited experience, especially in the case of new hires. Consider on-the-job coaching as a way to close a skills gap, instead of formal training. An employee with the scores listed above probably doesn’t need training in Customer Relationship Management (CRM) software. But, they do have negotiation and Excel skills gaps. Negotiation skills are marked as more important than Excel, so employee training and development should begin there. There are two ways to fill skills gaps: training and hiring. Decide which approach (or combination) works best for each skill gap. More than half of companies train and develop their staff to fill open positions. Offer training for employees in skills you’d like to strengthen, for example using SAP or Excel. The right training can help you close gaps between current and desired skill levels. Subscriptions, online courses and educational material. Opportunities to obtain certifications like Project Management Professionals (PMP) or Professional Certified Marketer (PCM). Modify your hiring process to screen for skills your company needs. For example, you can add skills assessments (like writing samples) and numerical reasoning tests. Use structured interviews to reduce biases and ensure your criteria for choosing a new hire are strictly job-related. Source passive candidates. Often, candidates who have the skills you need aren’t looking for a job. Use effective sourcing techniques (like recruiting on Twitter and sourcing using boolean logic) to find and contact promising candidates. 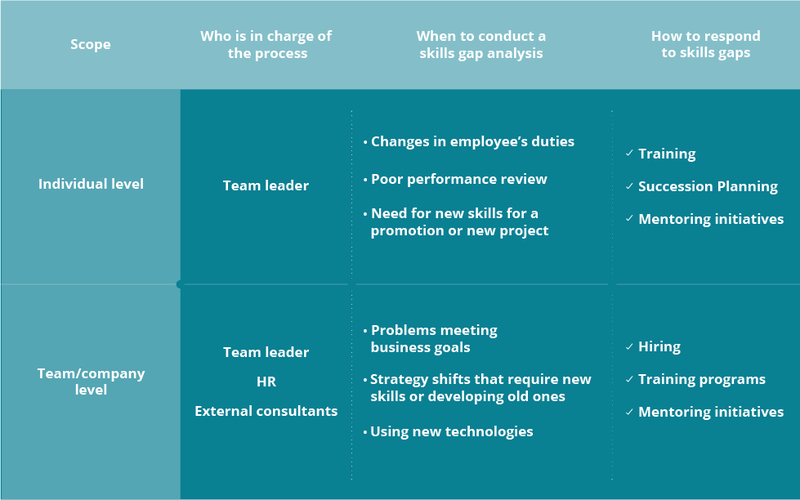 Conducting a skills gap analysis can be time-consuming. But the results are worth it. Knowing which skills you need to grow as a business will help you hire – and retain – the right people.